Me? Not so much. If I find a faster, easier, tastier way to make my bird, no tradition or whining from the family is going to stop me. I've found such a method with my Tomtastic Spatchcocked Turkey, so named after a turkey we picked out alive from a farm one year and butchered ourselves. (We loved you, Tom!) The recipe both brines the bird and layers herb butter under the skin for maximum moistness, and though you have to cook the stuffing on the side, there will be plenty of time. 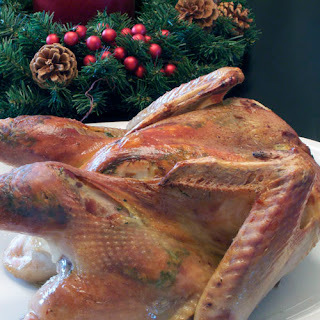 This turkey cooks in 90 minutes because its spatchcocked (a fancy word for butterflied). Of course, you don't need to publicize that to the family. If you want, pretend you're working oh so hard in the kitchen while you're actually sipping a glass of pre-dinner wine. First and foremost, let's spatchcock. The goal is to butterfly the turkey until it can lay flat. Though it takes bravery to try it, it's really simple. Just cut along the both sides of the turkey's backbone. You can use a big, sharp knife or powerful kitchen shears. Turn the turkey over and flatten it by using your hands and body weight to break the breast bone. The Bitten Word has a great instructional video here. Put turkey in a brining bag or a large pot with enough room to cover the bird. Brine the turkey overnight or up to 24 hours. Next make the herb butter. In a shallow bowl, put cold butter on top of the minced garlic and herbs. Mash using a fork until the mixture is evenly distributed. If using the butter right away, set aside. If not, shape the butter into a log and saran wrap it before putting it in the fridge. Next, we move to the turkey. Preheat the oven to 450°F. Remove the turkey from the brine, rinse it well and pat dry. Using a small, sharp knife, make incisions in the armpits, then gently use your fingers to loosen the skin to make a pocket running all the way down to the legs. Don’t tear the skin, if possible. Make another cut at the hip, if you have to. Carefully slide in the herb butter into your pockets. Press from the outside of the skin to distribute the butter evenly under the surface. Place the turkey on a rimmed baking sheet, breast up. Brush the bird all over with olive oil. Roast, rotating the sheet halfway through and basting twice, until an instant-read thermometer in the thickest part of the thigh reaches 165°F, which is usually about 1 hour and 10 minutes. Let the turkey stand for 20 minutes before you carve.